The heat, lack of sleep and humidity was taking a bad toll on me. I had just finished my work in Ernakulam, and was preparing to head home. I had to return to Bangalore the same day, and I hadn't booked any return ticket. I was initially planning to take a super deluxe bus back, but the experience the previous night left me confused. I drove straight to the KSRTC bus station in Ernakulam and in the meantime called up home for an opinion. As I disconnected the call, I just confirmed my thoughts - Comfort is more important. 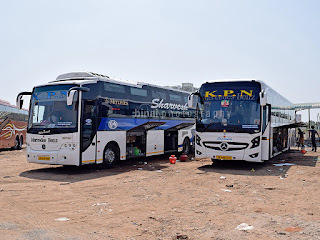 Without a second thought, I headed straight to the ticket reservation counter and asked for a ticket in the Kottayam-Bangalore Volvo Multi-axle with a boarding at Thrissur. The guy at the counter was bit confused with my request - he searched on the portal to confirm that such a service existed and then printed out a ticket. The fare was Rs. 1161 plus reservation charges (the antiquated reservation system of Kerala RTC makes you pay end-to-end irrespective of where you board from). The ticket issued did not have the boarding time - another problem with the reservation website. The good Samaritan sitting at the booking counter informed that the boarding time at 6pm as he gave me the ticket. Now, I was sure this timing was wrong. The bus leaves Kottayam only at 4pm, and there is no way this bus could reach Thrissur in 2 hours. Anyways, I thanked him and left the counter. I felt too sick to drive home - but had no choice. I reached home and had a power nap (woke up multiple times hearing my own snore). Although I was sure the bus wouldn't reach Thrissur at 6pm - in fact, a friend of mine was in Kottayam when the bus left and he got me the drivers' number as well - I did not want to take chances. I left home at around 5pm - my brother dropped me at the nearest bus stop (too tired to walk 500 metres!). 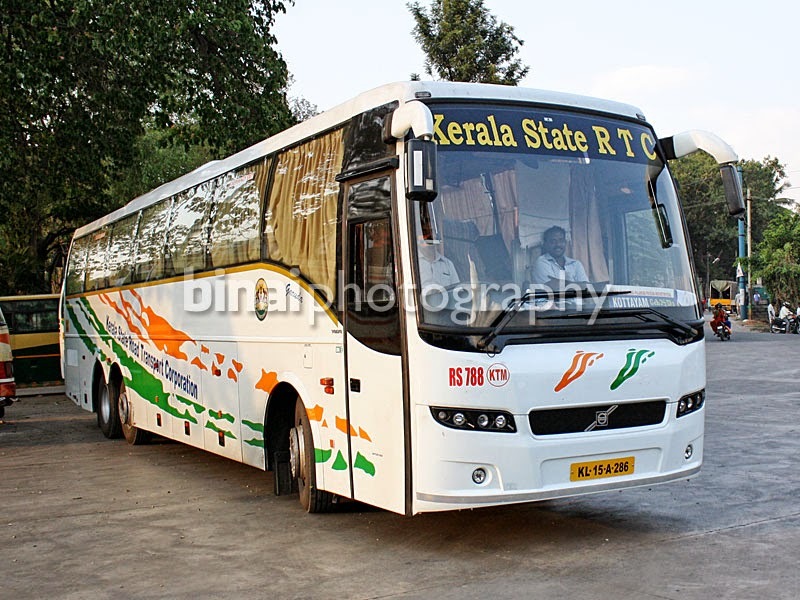 I got a bus to Thrissur soon after reaching there. Sometime past 6pm, I made a call to the driver - the co-driver picked up the call. When asked where they were, he said, "Just passed Muvattupuzha. Will take another 1.5hrs to Thrissur". Oh! So that meant I had lots of time to spend at Thrissur. I reached Thrissur at around 1815hrs. After roaming around the bus station for some time, I headed out to a restaurant outside to have an early dinner. I returned to the bus station after about 1900hrs. It was getting dark now - it was still hot, and I could feel hot waves emanating from the ground. I was too tired to walk around now - so headed straight to the old fuel station and decided to stay around there. As the clock ticked past 1935hrs, I was getting too impatient and tired. I badly wanted to call the Control room and give them a piece of my mind for putting up such impossible timings - but then I was too tired even to do that. The bus - RS788, KL-15-A-286 of Kottayam Depot. As the clocked ticked 1941, RS788 of Kottayam Depot (KL-15-A-286) slowly pulled into the bus station - It was Jerish of Thrissur depot at the wheels - he was all smiles as he saw me. He briefly stopped near me, and then headed to an empty bay at the terminal. 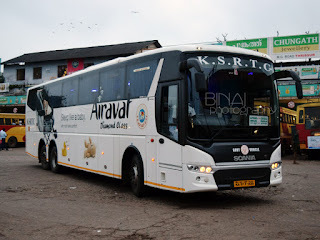 I was the only guy reserved from Thrissur - since the bus hardly had about 12 passengers, the conductor went to the announcement office and got the arrival of this bus announced. About 2-3 people came enquiring about seats, but they disappeared hearing the fare. After some futile attempts to get some people to get into the bus, the conductor signalled the drivers to start - we backed out at 2002hrs. No movie was played, but songs were being played. Jerish was at home as we hit Mannuthy bypass - he was quick in overtaking other vehicles and got his overtakes perfect. 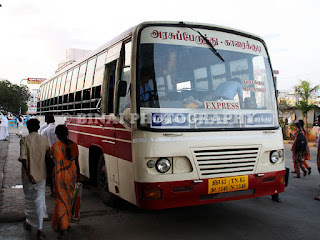 The bus pulled into a newly opened restaurant near Mangalam palam for dinner (2059hrs). I used this time to walk around a bit and inspect the bus. This bus had sustained some serious injuries during its first run through the pothole ridden Mananthavady-Kutta-Gonikoppa route. The engine was left on during the break. Some passengers were in the bus itself. After some stretching, I returned to the bus and got set to sleep. The bus started off at 2127hrs. I slowly slipped into some serious sleep as Jerish continued his run. I woke up just as the bus stopped somewhere - we were inside Palakkad town then. Some traffic rearrangements meant that we were taking a longer route to the bus station - and our drivers did not know the way. So, they had stopped to ask for directions. After some confusions, we finally pulled into the fuel station near the bus station at 2219hrs. We left at 2224hrs after taking in 97 litres of diesel. By now the Thiruvalla-Bangalore Super Deluxe too came in. We reached Palakkad bus station at 2227hrs. We were successful in getting two passengers from here, and we started off at 2233 hrs. I slept soon after we started off from Palakkad. The driver had changed now, and the second guy was a bit too slow. I had a nice continuous sleep. I am not sure if the bus stopped anywhere on the way. I woke up just as we were passing Hosur - it was 0455hrs then. I had another short nap - only to wake up as we reached Electronic City. The bus did not take the flyover this time as well. I headed to the cabin as we neared Singasanda - the driver was too slow - he was sticking to 60kmph on the middle lane - he was probably trying to adjust the timings, instead of going to Satellite BS too early. I finally got off at Bommanahalli signal, at 0537hrs. End notes: The bus was quite new - so I wouldn't comment on its maintenance. It was clean - both inside and outside. Both the drivers were quite stable on the road - no rash driving and they did not give that feeling of speed inside. The running time was surely high - 9h35m is too, too, too high for 454 kms. Even if I discount the time spent for dinner, its still high. They do not provide Blankets (I am not particular about water bottles), still. The crew need more fine-tuning to meet the needs of a premium service - they still carry on the "I don't care" 'legacy', which isn't good for a premium service. The conductor never bothered closing the curtains - so all the light from the on-coming traffic was inside. But I'll give the benefit of doubt, and surely give them another chance. Will I take this service again? Will surely give another chance. They need to better their timings still though.